Stand out from the crowd or make sure workers can be seen at night and in dim lighting conditions with Seton’s range of high visibility clothing. The inability to be seen leaves workers at risk of an accident, but using high visibility clothing will significantly reduce the risk. Keeping employees visible in dim light or poor weather conditions, or ensuring that key personnel can be easily located is an essential part of the legally required health and safety strategy. Make sure you stay on the right side of the law with the comprehensive range of health and safety products available and look at our buying guide for more information. Being visible is a key part of safety and the range of high visibility clothing available at Seton will help your staff to achieve this. High visibility clothing is an important safety measure in many lines of work but is particularly crucial in areas of high traffic, including construction sites, road maintenance and busy warehouses. This is even more essential when continuing to work after dark. High visibility clothing is also useful to identify key personnel who may need to be located quickly, such as first aiders, marshals and fire officers. At Seton, we have a wide range of high visibility clothing designed to suit a variety of different workplaces and roles. 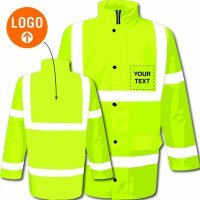 The range of high visibility clothing includes vests, which can be easily slipped over the top of other clothing, and jackets and trousers. All are made from a luminous material that will clearly stand out and include reflective bands that will reflect lights, including vehicle headlights, to improve safety after dark. Because workers who require high visibility clothing are likely to be carrying out a lot of work outdoors in all weather conditions, the range includes padded jackets for extra warmth, and waterproof clothing to protect from splashes and rain. 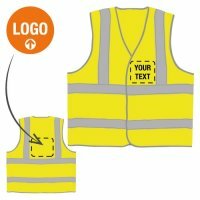 You can turn any clothing into high visibility clothing with the use of high visibility armbands. This can be a very cost-effective measure and we have a selection with bold lettering to identify key personnel. If we do not have the lettering you require, you also have the option of a customisable armband, which can be created to fit your needs. It is a legal requirement for employers to take effective measures to reduce the risk of accidents and injuries in hazardous areas. The use of personal protective equipment (PPE), including high visibility clothing, will greatly increase the safety of your workers. Understanding all of your obligations under the current health and safety rules can be a challenge, but the large range of safety equipment available at Seton will make creating safe working processes much easier, as we live up to our motto of ‘safety made easy’. All of our products comply with the necessary health and safety legislation, allowing you to shop with confidence. Accidents at work can have devastating and sometimes even fatal consequences, but very often, simple health and safety measures can prevent them from happening or at least reduce the severity. Providing high visibility clothing will enable your workers to be seen by drivers, whether they are on your premises or working off-site, increasing the safety of both the workers and vehicle drivers. 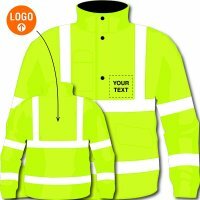 For anyone working in areas of high traffic volume or after dark, having well-made high visibility clothing is particularly reassuring and will enable them to complete their work efficiently and without worry.